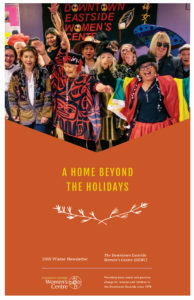 Donating to the Downtown Eastside Women’s Centre (DEWC) directly contributes to basic needs and positive change for women in the Downtown Eastside, and makes for a meaningful memorial, holiday, or birthday gift. Note: your tax receipt will be sent to you, the donor, and an acknowledgement sent to your chosen recipient. If you would prefer the acknowledgement be sent to you, input your own email or address in the “Tribute Email” and/or “Tribute Mailing Address” fields.